Our parish was organized as St. James Church on August 14, 1848, the same year in which the City of Syracuse was formed. 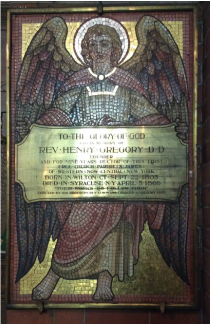 Its founder and first Rector, Dr. Henry Gregory, supported many tenets of the Anglo-Catholic or “High Church” movement. At a time when most churches required parishioners to pay “rent” for their seats in church, he formed this church as the first “freely seated and freely supported” parish in the Episcopal Diocese of Western New York and only the second in the entire state. To the right of the high altar is a mosaic and brass tablet erected as a memorial to Dr. Gregory by his brothers in 1892. The seats in the Chapel are not to be sold or rented, but are free to all who come to worship. It is a “House of Prayer for all people” – “all sorts and conditions of men”. The ministrations are to be sustained, not by pew rents or subscriptions, but by the voluntary offerings of the congregation, on every “first day of the week” - the rich giving of their abundance, and the poor of their penury, as God shall prosper them. That the members of this Congregation, by their lives of humble, earnest and self - denying piety, may promote the cause of true religion, is my fervent desire. I have no wish for that gilded prosperity which “may be purchased with money”. It is not numbers, it is not show, it is not loud profession, it is not the display of deeds which seem religious, but are really the bribes of human praise, which will stand the trial of the last great day, or profit our souls in the hour of death. Dr. Gregory left St. James in April 1857 to become the president of De Veaux College in Niagara Falls, NY. He was succeeded by the Rev. 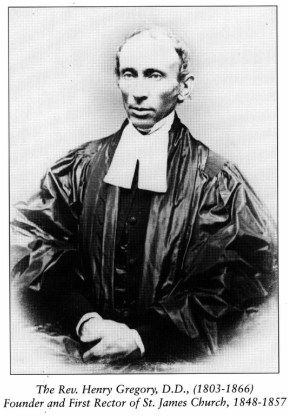 Cuthbert C. Barclay, who served from April 1857 to August 1858.